Spring is a wonderful season, rich in symbolism and meaning. Rebirth, renewal, and new beginnings are the hallmark of this season, with the dormant potential of Winter now in full bloom in nature. Trees are erupting with leaves, and the first phase of flowering plants is in full bloom. Spring is a great time for Spring cleaning – aptly named! Time to clean out closets and drawers, sort through things that have accumulated throughout the season, and do an overall "lightening" up. It's also a great time to take care of your health, begin a new or renewed fitness program, and clean out those foods or behaviors that have crept into your diet and lifestyle. For those individuals who are sensitive to the seasonal changes that accompany Spring, like added discomforts due to pollen and allergens, it's is a great time to support your body's natural ability to fight the effects of seasonal allergies. 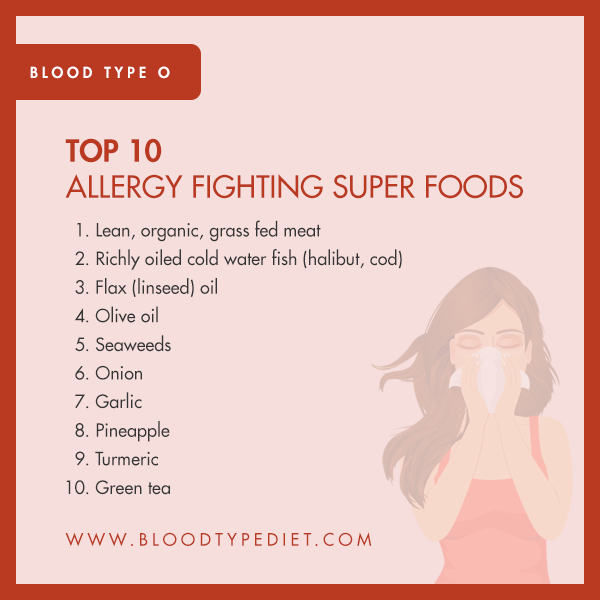 Following your Blood Type Diet provides the foundation for optimizing your body's natural defenses to these seasonal discomforts, and you can further support yourself with some strategically chosen supplements designed for seasonal allergy relief. So clean out the clutter, eat right, and enjoy the rewards of renewal that Spring offers each of us. Allergy means "altered working." Watery eyes and a runny nose are great when your body is fighting off a virus to help wash away the offending germs. But when there's no actual threat to the body, these uncomfortable symptoms serve no purpose. Immune cells, called IgE, are created by the body in response to specific allergens. Once created, they can last for months, immediately releasing histamine and causing symptoms whenever the offending substance is eaten or breathed in. Anti-histamines suppress allergy symptoms, because histamine is the chemical responsible for them. Environmental allergies can be caused by pollen, animal dander, smoke, or chemicals such as air fresheners or pollution. Pollen is the egg-shaped male reproductive cell of flowering plants. It is typically smaller than the width of a human hair and often carried by the wind from one plant to another. Each species' pollen is slightly different, so it's possible to be allergic to the pollen from one specific plant but not another, or to be allergic to many of them. Food allergies can cause hives, digestive problems, eczema, and respiratory reactions. Food sensitivities or intolerances don't create IgE cells, but can still cause digestive or mood problems, and can increase the body's allergic response to other substances. True food allergies usually cause symptoms within 2 hours -- sometimes in under a minute. This is why an epi-pen is carried by many with severe food allergies - in case accidental exposure to an allergen causes the throat to start closing up. Allergies can lead to complications like sinusitis, asthma, or ear infections. Sinusitis can occur when excess mucus in the sinus cavity is not properly drained, and harmful bacteria or fungi grow out of control. Ear infections can occur when the Eustachian tube is not properly drained, and pathogens take root. Both of these conditions are worsened when allergies increase mucus in the nose. Extrinsic asthma, also called atopic asthma, is directly related to allergens and IgE reactions. Intrinsic asthma is caused by cold air, infections, inhaled irritants, exercise, or emotional upset. Atopic asthma is more common in children, but most asthma sufferers have a combination of the two types. The body's response to allergens can be mediated by reducing overall stress on the body. This is how the Blood Type Diet can help. Red blood cells have chemicals called antigens on the outer surface, which vary by blood type. Many foods contain natural chemicals called lectins, many of which interact with blood type antigens. Often times the body can handle the effects of dietary lectins OR environmental allergens, but the combination causes symptoms. 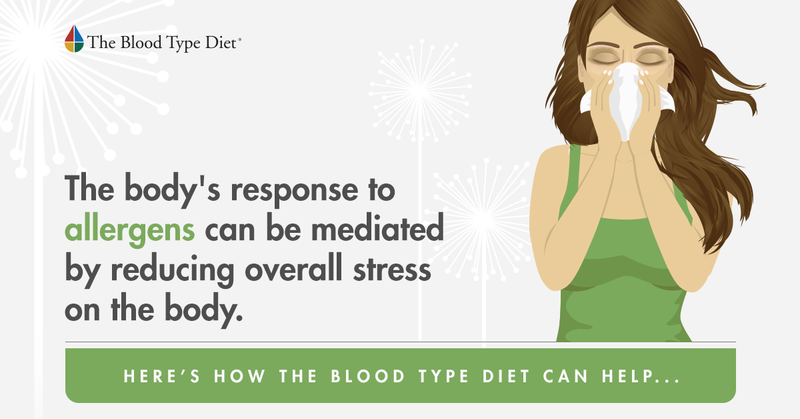 Blood type also affects how efficiently we can digest carbohydrates or red meat. "Leaky gut" is more likely to develop when eating foods we have trouble digesting, or that have too many harmful lectins. This is a type of GI damage where there are tiny holes in the walls of the digestive system, which allows larger food molecules to be absorbed. More lectins and allergens get into the blood stream where they can cause problems. A healthy GI system will break down foods into smaller particles before they're absorbed, reducing the chance of reactions. Lectins can bind with IgE molecules and make them release histamine. A diet high in harmful lectins can also increase overall inflammation. Seasonal allergies can be a nuisance. 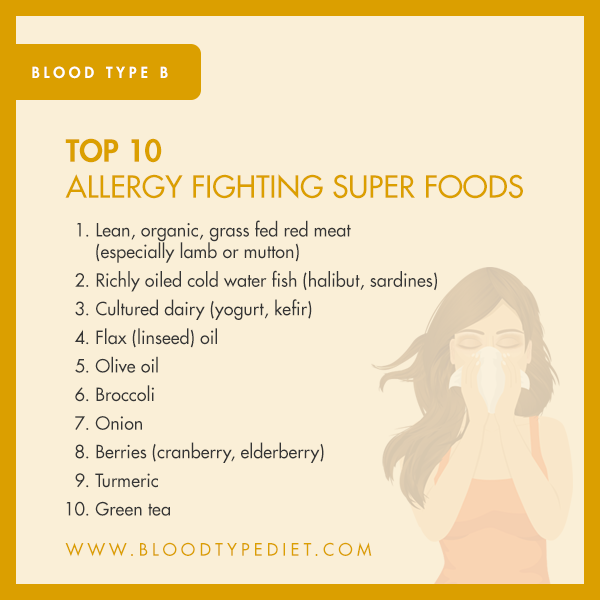 Following a Blood Type Diet nutrition plan can help to balance your immune system, reduce inflammatory activity, and make you more keenly aware of environmental and dietary factors that trigger allergic response. Here are the top 10 foods by blood type that help to support your body and minimize the level of allergic responses. Abundant blooms and changing foliage are among the joys of the changing seasons. Breathe easy and achieve optimal health by following your specific Blood Type Diet, GenoType Diet, or SWAMI protocol. Find additional seasonal support with Dr. Peter J. D'Adamo's unique naturopathic supplement formulas. Quercetin is a natural, plant-derived flavonoid 400 times more potent than vitamin E that protects against free radical damage. 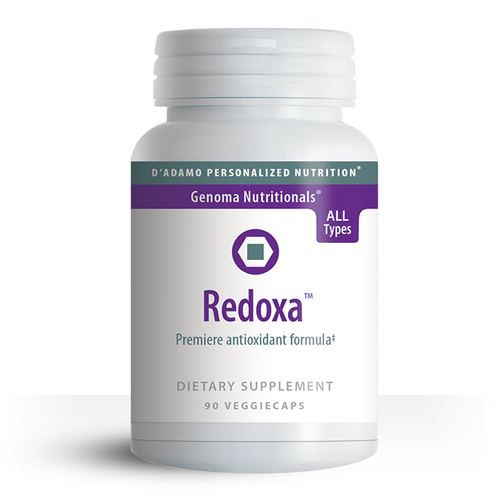 Additionally, Quercetin has been used for decades to help support a healthy cardiovascular and immune system. Another common use of Quercetin has to do with its ability to support the healthy response to occasional inflammation following sports activity. As Quercetin bioflavonoids are not easily assimilated through the gut wall, Dr. Peter J. D'Adamo has added Bromelain enzyme to the formula to enhance absorption. 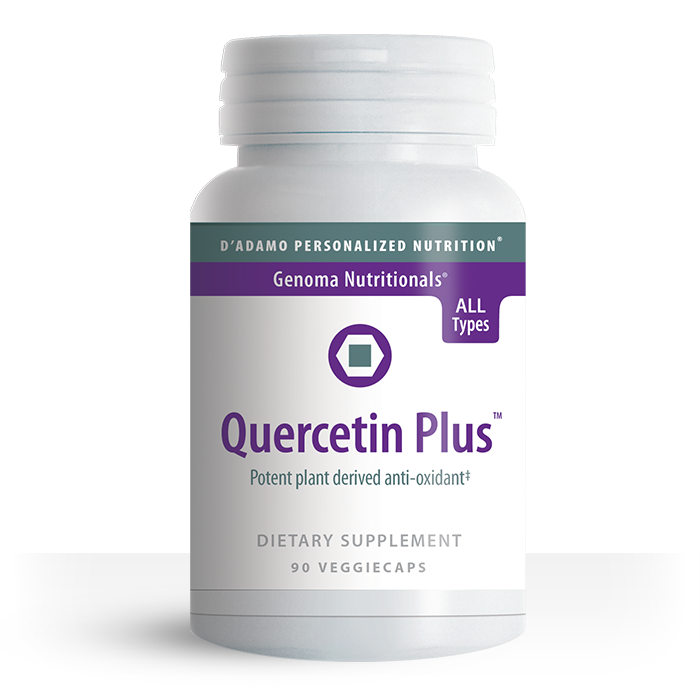 Our Quercetin formula is hypoallergenic, and it is derived from non-lectin containing sources. 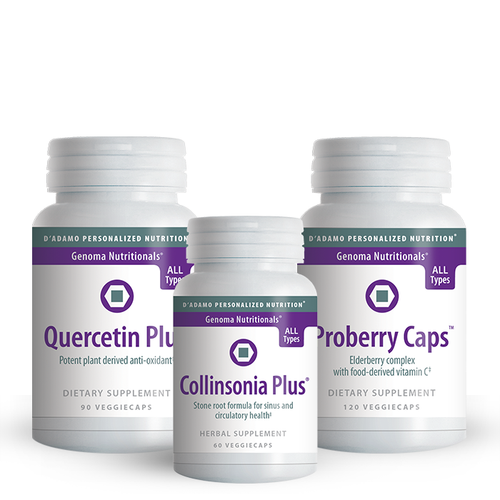 All blood types and GenoTypes can use Quercetin Plus. In developing Collinsonia Plus, Dr. Peter J. D'Adamo took an entirely different approach. He reasoned that the best way to maintain healthy sinuses would not be to simply apply healing agents to the external surfaces of the sinuses, but rather to help them maintain their healthy function from within. In this one-of-a-kind formula, Dr. D'Adamo blended Collinsonia, or stone root, with the highest quality larch arabinogalactan to naturally maintain the health and comfort of the throat and sinus cavity. Our popular pack for seasonal allergy relief combines three formulas to form a powerful, natural defense for occasional symptoms related to allergies. Each pack saves you 15% over purchasing these products separately. Blood-type-specific protocols for targeted vitamins, supplements, and herbs. Finally, Allergies includes a four-week plan for getting started that offers practical strategies for eating, exercising, and living right to prevent, fight, manage, and treat the symptoms. 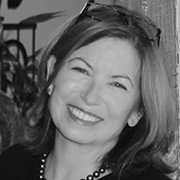 "I am so grateful to have learned from Dr. D'Adamo about Collinsonia. I always have an extra bottle so that I never run out. I use a very small amount in the winter and then start increasing in February before the flowers blossom (Calif.). I use it all year round except for a 6 week break around Christmas. My hayfever used to be so bad that I couldn't sleep, my eyes and throat were so itchy. Now I feel like a normal person, and no bad side-effects. Over-the-counter drugstore allergy meds often leave me with a dry nose and broken capillaries. My husband switched to Collinsonia, too. I also take Quercetin every day. 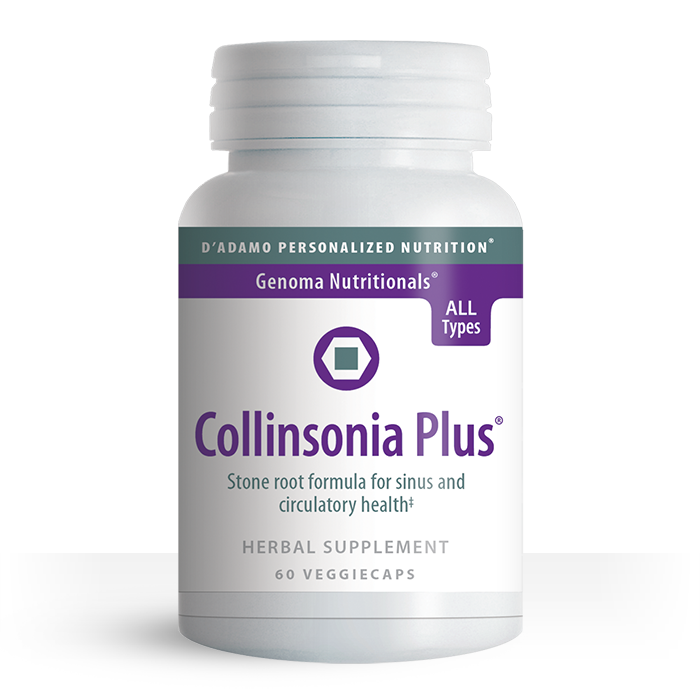 Like all natural medicines, it takes a while to work, but I walk outside every day in dry, windy weather and always feel great with Collinsonia. I don't usually spend my time writing reviews--but I like to help people be healthy and this stuff works (give it a while)." First of all, how cool is this? A middle school class and their health teacher, Thomas "Rusty" Staab, applied for a TAP Grant to fund a study of blood type and human nutrition. Curious minds and healthy nutrition are a great foundation. A round of applause to Rusty and his students. To read more about the study, click on the link below. "Most people think that this blood type diet is just another fad diet that doesn't actually work. When looking at it in my eyes, it's not just a quick weight loss solution, it's just the diet someone should follow throughout their life. I'm not saying that everyone should function like robots and eat exactly what the diet says, but being a little more aware of how food makes you feel can help out so much in the long run. Who doesn't want to have more energy?" Blood type and secretor status can influence the breast milk of nursing mom's. Mom's secretor status has a lot of influence on the microbiome of her breast-fed child. The principal sugars in human breast milk are rich in the glycan fucose, but milk from non-secretor moms is much lower in its fucose content. Bifidobacterium longum, a critical early colonizer of the gastrointestinal tract of infants, loves fucose, which is why it grows so readily in breast-fed infants of ABO secretor moms. Non-secretor moms who breast feed infants might benefit using a dietary fucose source as a prebiotic for the infant, or consider consuming sea vegetables, such as seaweeds. Since neuronal attachments are largely mediated through fucose-specific lectin ligands, developmental benefits may also result. This is especially true for Blood Type As with their cortisol clearance issues and higher risk of cardiovascular problems, however all blood types can benefit from daily practice. 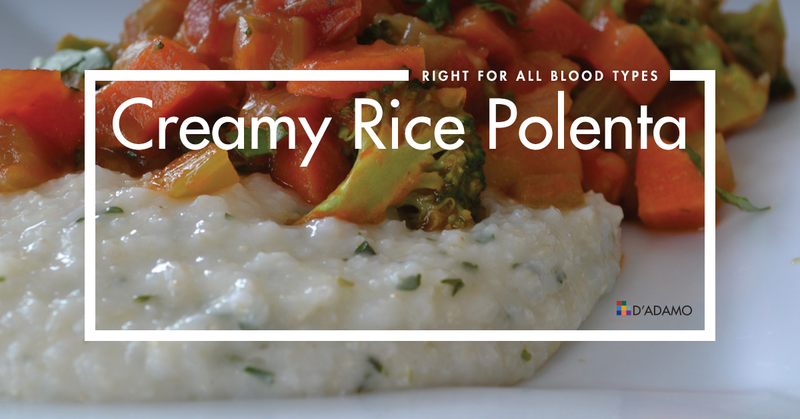 This rice polenta is the trifecta of recipes – easy to make, awesome tasting, and right for all blood types. It goes well with grilled veggies for an easy lunch or as a compliment to fish, poultry, beef, or lamb. A wonderful staple recipe as you head into spring. Cook brown rice farina according to the package instructions. Two minutes before the farina is finished cooking, add remaining ingredients, stirring constantly. If you prefer a more firm polenta cook about 3-5 minutes longer.